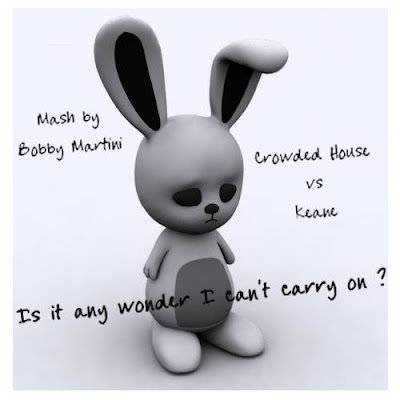 Bobby Martini's Mashups & Mixes: Crowded House vs Keane Mashup "Is It Any Wonder I Can't Carry On ?" Crowded House vs Keane Mashup "Is It Any Wonder I Can't Carry On ?" The second of a Crowded House trilogy. This features one of my favourite tracks of all time 'Can't Carry On' by Crowded House along with 'Is It Any Wonder', the first single from Keane's second album. "Is It Any Wonder I Can't Carry On" can be found at the usual address - www.bobbymartini.co.uk on mashups page 10. The third in the trilogy is a fusion with Peter Gabriel.....it's been a while since me and Pete got together so watch this space !!!! Colatron - a bloody top bloke ! I'm a mashup producer based in the UK. I have been producing mashups since May 2006. All of my work is for evaluation purposes only. If you like what you hear then please download or buy the originals from legal download sites.